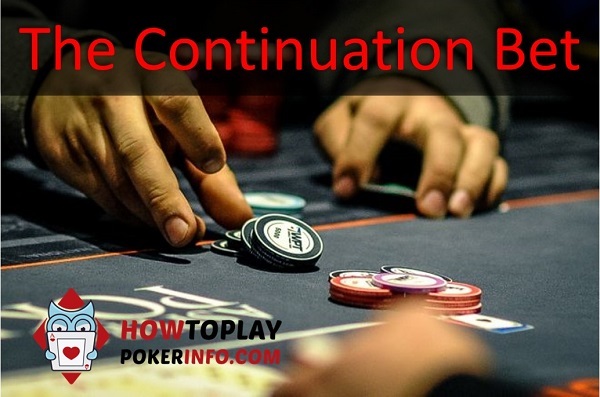 The continuation bet is a critical part of your overall poker strategy. During the poker boom, it didn’t take long for some of the top poker players to realise that if you bet the flop after raising preflop you would often take down the pot with little resistance from their passive opponents – the cbet was born. In the years proceeding the boom, even the fish knew that if they cbet 100% of the time they made huge profits. Unfortunately, times have changed and cbetting 100% of the time doesn’t work anymore. The strategies are now more nuanced but there is still a lot of money to be made. The continuation bet is simply the player who made the aggressive action (bet or raise) on the previous street continuing that aggression on the next street with another bet – it doesn’t only apply to the flop. Before we continue, you need to understand what are the reasons we bet. Understanding the first two points is critical to poker success. 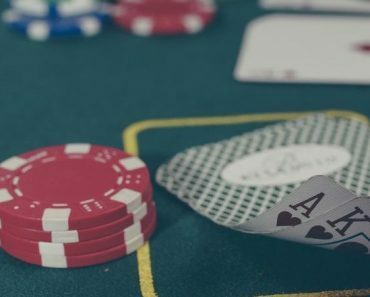 A huge mistake new players make is betting in situations where they are neither getting called by worse hands or folding out better hands – i.e. all of the better hands call, and all of the worse hands fold. Before you bet (whether is be a cbet or any other type of bet) you should STOP, and think about what you are trying to accomplish with your bet. Don’t be the guy who is clicking buttons (or throwing around chips if you play live) and not understanding why you are betting. 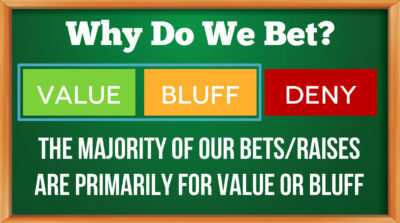 For more information on this why you should be betting, see this article by SplitSuit. Continuation betting is part of almost all poker players basic strategy but it may not be clear why they cbet so first up let’s explain why a continuation bet works. That means as it stands the UTG player has the stronger range and is more likely to win the pot – therefore should be more likely to bet on the flop/turn/river with their range of hands (depending on the board, however). The additional factor is nut advantage: the UTG player has AA-QQ which the BTN player does not (as he would typically 3bet these hands preflop) which means that the UTG player will often have more strong hands on more flops than the BTN player. 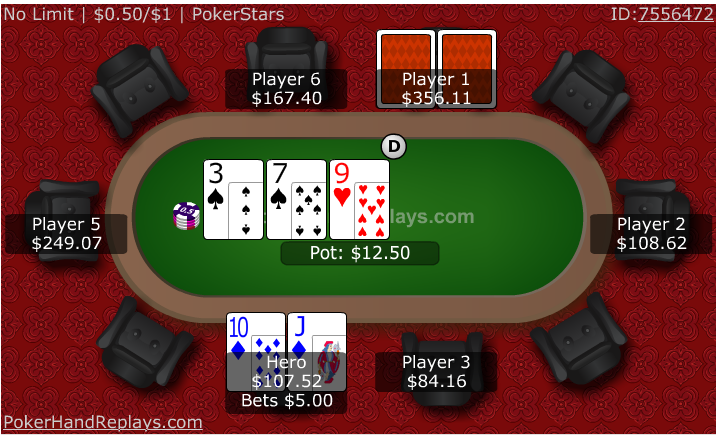 It is difficult to hit flops – over 60% of the time you will not have a pair to continue with, so the player with the strongest range can bet and often take the pot down. Opponents will typically give you the benefit of the doubt and fold a better hand than yours to your cbet. This is the power of cbetting, the player who had the betting lead beforehand now will continue with the lead and will quite often win the pot and pick up the dead money in the middle. So that’s the basics of why a cbet works, but you still shouldn’t cbet 100% of the time. Let’s discuss some of the factors you should consider before placing your continuation bet. So you can see a lot goes into determining whether you should cbet. Let’s explain each of these points in more detail. When playing poker you can either be in position or out of position – acting last or first compared to your opponent. If you aren’t sure what that means I would recommend that you check out our strategy guide on position which explains poker position in more detail than we will in this article. However, in summary, being in position gives you a huge advantage over your opponent as you have more information to act upon (because you act after your opponent). It also makes it more difficult for our opponent to float us and take the pot away later with a bluff. Due to this information advantage and the difficulty our opponent will have bluffing on later streets, we can cbet more liberally in position. The greater the number of players in the pot, the stronger the hand required to continue. Top pair may be a great hand when we are heads up vs a single opponent – however against 5 opponents top pair is a mediocre hand that should be played very cautiously. Similarly, when cbetting multiway, you should be very selective in the hands that you choose. The greater the number of players, the stronger your hand requirements and the less frequently you should be bluffing. Multiway, you should only cbet “bluff” with hands with substantial equity such as monster flush and straight combo draws. We won’t discuss the different types of opponents in detail in this section. 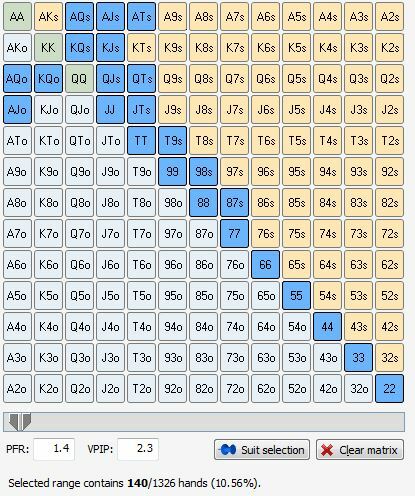 If you want to learn more about opponent types you should check out our texas holdem strategy guide. But to surmise, there are 4 general categories you can categorize your opponent: Tight aggressive (TAg), Loose aggressive (LAg), tight passive and loose passive. 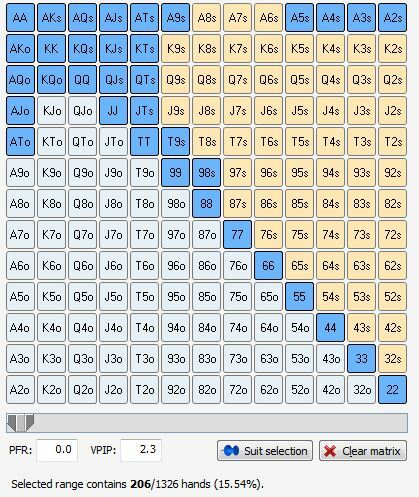 You want to target your cbet bluffs towards opponents who are likely to fold (overfolding). Bluffing against fish who won’t fold any bad high card or backdoor draws is obviously a poor strategy, however, it’s a very common mistake. You also want to target your thin value cbets towards opponents who are unlikely to fold (overcall). For example, if you have middle pair vs an opponent who won’t fold a backdoor draw, betting makes a lot of sense, right? Cbet cautiously vs competent and aggressive opponents. Opponents who are not likely to overfold or overcall are difficult to play against and may even put you in some difficult spots with well-timed check-raises. See this article by UltimatePokerCoaching for more on playing TAg style. So you need to evaluate your opponent, determine whether they are likely to overcall, or overfold and adjust accordingly by bluffing more or less frequently. When playing against competent opponents err on the side of caution. We discuss the differences between dry and wet board texture in more detail here – so if you aren’t familiar with that you should check that out. Board texture will play a big role in the type of hands you will cbet as different boards will improve our opponents and our own range differently. Dry boards with one high card and no draws are great for cbetting. This is particularly true when the high card is an ace or king e.g. A72 or K53. The reason that this is a great board to cbet is that it is a difficult board to hit and it doesn’t change the preflop ranges very much, so the range that had the equity advantage previously will continue to have an equity advantage. 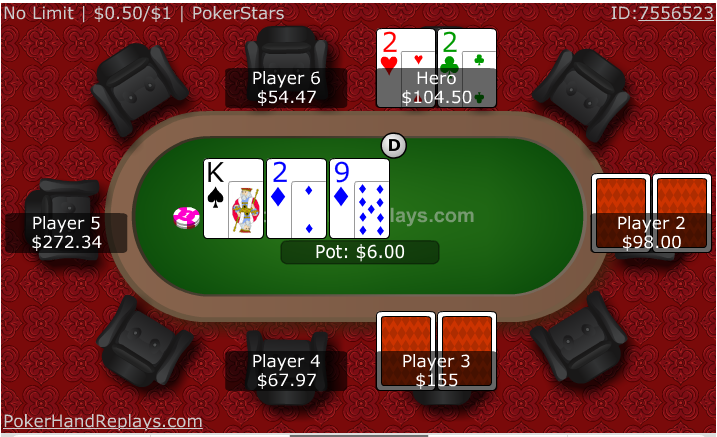 In addition, it’s hard for an opponent to make a hand on this board and therefore a bet is very likely to win the pot. Wet boards are bad for cbet bluffing because your opponent can have many hands that want to call your bet – thus your cbet bluff will not be successful very often. 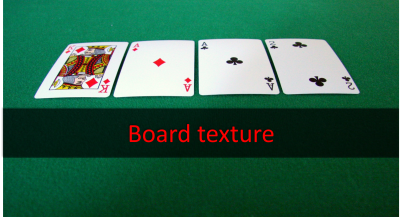 You should tend to bet smaller on dry board textures and bet larger on wet board textures. Pot equity is one of the most important concepts in poker which defines how likely it is that you will win the pot if hands went to showdown. However, pot equity isn’t simple and requires some experience to accurately gauge. 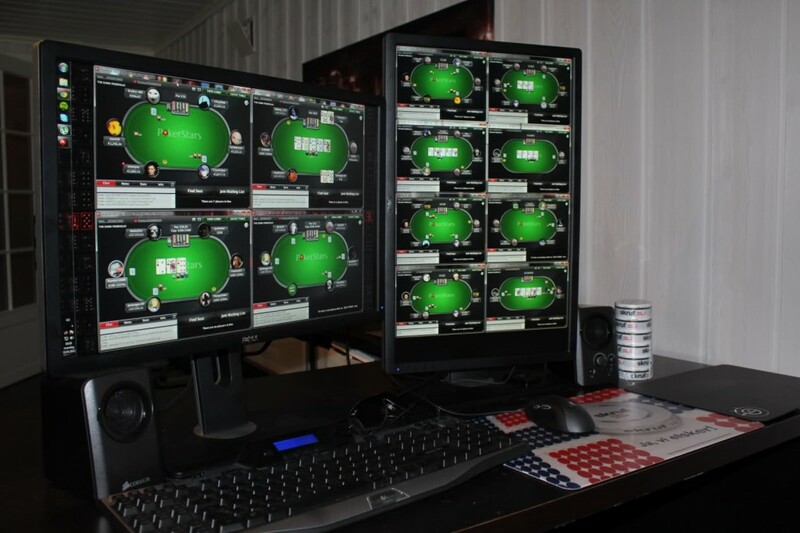 Flush draws and straight draws give you significant equity which makes them excellent candidates to be cbet in most scenarios. Exceptions to this are when you also have showdown value to go with your draw – for example middle pair and a flush draw. Since draws are not yet a made hand, winning the pot is a great result are you are typically going to be folding hands that are better than yours but even when called you stand still a strong chance of winning the pot plus you have the opportunity to continue bluffing. 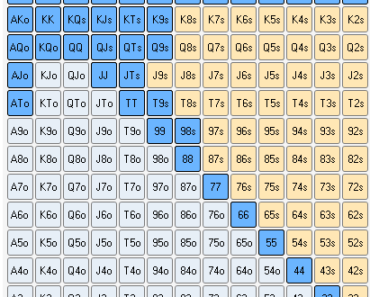 Overcards are also good to cbet as you often have 6 outs which will give you the best hand (>20% equity). 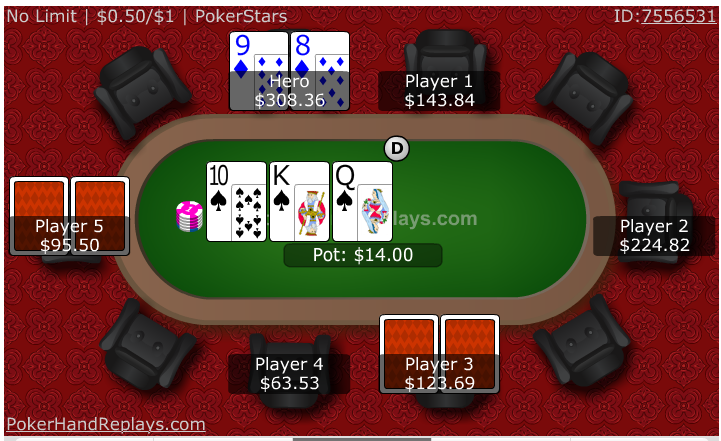 Hands with little to no equity (such as a 65dd on AsKh2c) are poor hands to cbet as you are relying fully on your opponent folding and have no possibility to win the pot when called. As we have already mentioned, you should vary your continuation betting strategy depending on your opponents tendencies. Well, one key tendency you should look out for is how often your opponent is to call a flop cbet and then fold to a turn or river barrel. If you do find an opponent who calls frequently calls flop cbets and folds on later streets you have just come across a GOLD MINE. You have basically found someone who likes putting lots of money in the pot and then folding. On the other hand, if your opponent is very sticky on future streets, that should make you less likely to bluff the flop and more likely to value bet thinly. We will discuss this further, in the final section of this article as this is quite an advanced subject. On the board of 9h7s3s, we have a gutshot straight draw and two overcards. This board is would be reasonably wet and our opponent can have some draws as well as some top pair and overpair type hands. 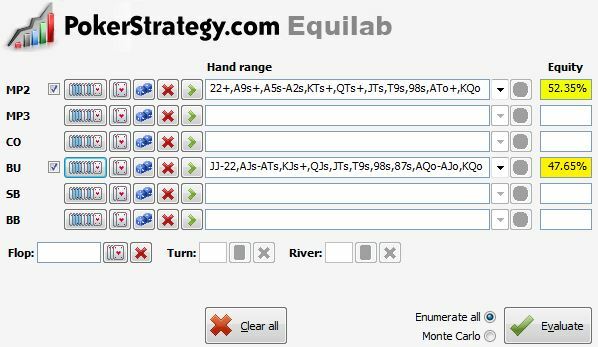 JTs is a great hand to cbet in this situation as we can make some great pairs on the turn and river and also can turn the nut straight. Hence this is a nice spot for a cbet as a bluff. We expect him to fold hands which are better than ours such as KQs, QJs, 22. However, if he does continue, we have a good chance of making a stronger hand with a Jack, Ten or 8. This hand would also become even better if there was a diamond on the board as we can turn backdoor flush draws to go along with our other equity. For some more experienced players, this may be an obvious cbetting spot but it’s good to discuss as some newer players may make the mistake of slow playing. We raised a pair of 2s from the button and the blinds both call and check the flop. This situation is a clear spot to value bet as the flop is quite wet with both players having plenty of draws and good pairs in their range that the can call with. We expect hands which are worse than our to call and since we have the third strongest hand possible at this point we want to try to build the pot as large as possible. We raised a limper with 98s and also get a call from the BB. On this board, we have no equity and are very unlikely to win if our cbet is called plus we are multiway. We should just give up on this flop and potentially look for an opportunity to take down the pot on later streets if our opponents show no interest in the pot. Don’t make the mistake of overvaluing the gutshot straight draw – any ace will beat us on a Jack turn or river and we could already be behind to a flush. Your opponent is aggressive and you are likely to see a check-raise – when you have a medium strength hand and get check-raised you will be put in a very tough spot. This is unlikely to happen against a passive opponent so you can value bet more of your medium strength hands liberally. But against an aggressive opponent, you should be more conservative. You have a hand with SDV – sometimes you have a hand that just wants to get to showdown (such as bottom pair). cbetting this hand will not achieve anything (fold out better or be called by worse) so it makes the most sense to add this to your checking range. Your opponent isn’t likely to fold if you are bluffing – fish don’t fold, so don’t bluff them with weak hands. You can induce your opponent to bluff – this is a strategy designed to exploit weak players. With strong hands, you can sometimes check back the flop instead of cbetting vs overly aggressive opponents. This will induce them to bluff and allow you to happily call their bet maybe even planning to raise their bets on a later street. There is no good answer to the question of what is a good cbetting percentage. In reality, it depends on all of the factors outlined above plus your overall strategy. But what we can say is that an average cbetting percentage of over 70% is too high and under 45% is too low. So a good number to aim for is around the 60% mark. That will give you plenty enough to bluff but not too much so that you can be easily exploited. This is an advanced strategy so I have saved this until the end of the article. After you cbet there will be opportunities where you can double barrel or even triple barrel bluff. For those of you who aren’t familiar with double barreling and triple barreling, it means following your flop cbet on the turn or river with more bets. For example, if you raise preflop, got one caller and bet the flop, turn and river (each time your opponent calls) that would be a triple barrel. Double and triple barreling can be a dangerous strategy, particularly at the low stakes games as players won’t like to fold their weak holdings. An excellent card to double barrel in this hand would be any A/K/Q as this is a scare card which improves our range more than our opponents. It also devalues any medium strength hands our opponent may have such as 7x or 44-66 which won’t be able to handle any more heat. Other good cards to double barrel would obviously be a J/T as that makes us top pair, but also a non-spade 2 as that doesn’t improve our opponents range but still leaves us in a strong drawing hand. Bad hands to barrel would be any 9/8/7/6/ or spade as these hands either improve our opponents range or devalue the strength our overcard/straight draw. Thus we should be inclined to slow down on these cards. So we have learned that continuation betting is critical to your poker success and it’s worthwhile putting in the time to make sure you get it right. Once you are taking into account some of the factors that we discussed such as opponent type and equity, you are doing better than the majority of poker players out there. But don’t stop there, work on other important factors such as play on future streets, double/triple barreling and using your opponent tendencies to make better decisions. Your bankroll will thank you for it!